The irony was not missed that it was Rosberg's own Mercedes team that set the whole thing in motion, inadvertently of course. 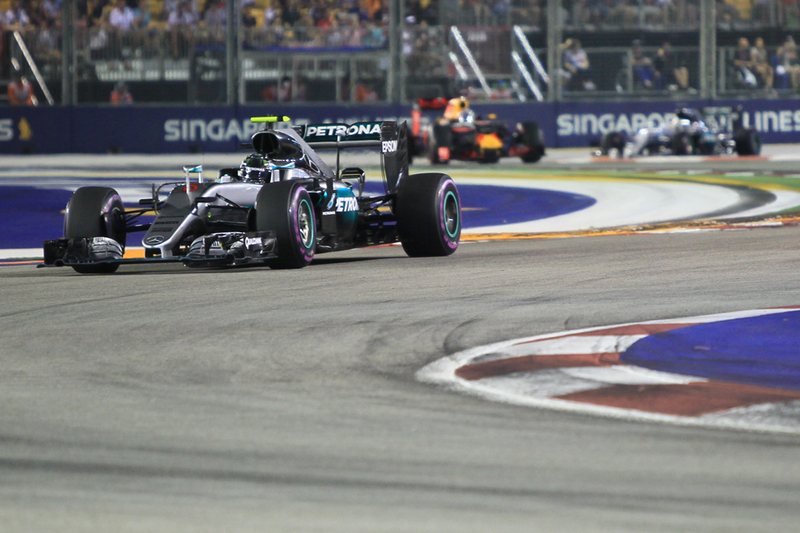 Lewis Hamilton was continuing his stroppy weekend, had complained already about his strategy and also had lost his third place to Kimi Raikkonen following an error. His team, with nothing to lose - or possibly to snap its charge out of his bad mood - on lap 39 told him they were switching to 'Plan B', which was a three-stopper rather than the original two. Lewis almost immediately found additional urge indeed, particularly after lap 45 when he bolted fresh supersofts on and right away set best sector times. Ferrari rather overreacted by bringing in Kimi to cover him off - as he was 28 seconds up the road with 15 laps remaining - and lost third place immediately as a result. Red Bull, with Daniel Ricciardo in second, as a result of all this itself had nothing to lose and, as is its wont, brought Ricciardo in too for fresh boots. "Lewis had a free stop, Kimi then covered him, we had nothing to lose but to cover and give it a go" said Red Bull boss Christian Horner afterwards. 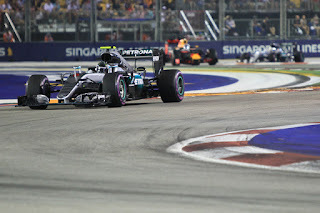 And his Merc counterpart Toto Wolff concurred that his team through all of this came close to scoring rather a chain reaction, ricocheted, own goal. "At that moment we concentrated on getting Lewis back to third" he said of the original decision to pit him again, "but equally I think that Ricciardo or Red Bull at that stage they thought about pitting. It was their only chance. But you're right...that this gave them the possibility." Merc it seemed was minded to pit Nico as well so to bring the whole thing full circle, and the pit crew indeed readied themselves. 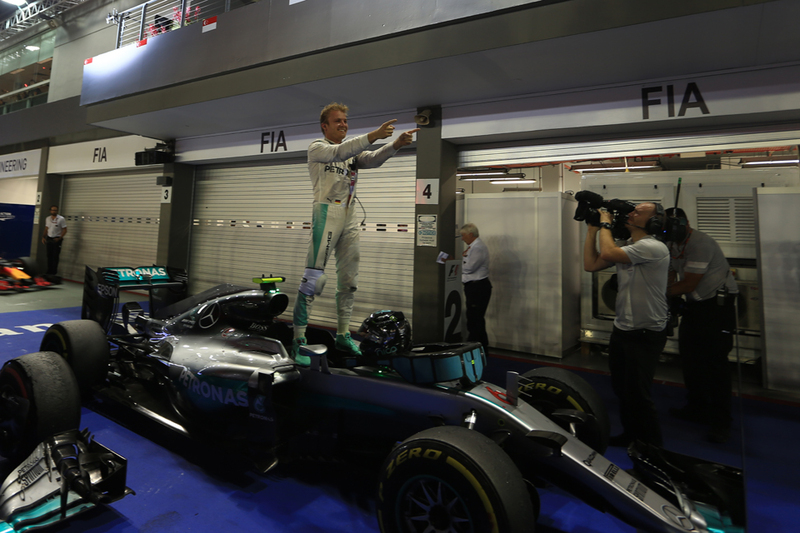 But... "we couldn't come in as I had traffic" said Rosberg, "so I was very slow in that lap." Wolff expanded on the subject. "We couldn't do that [pit again] as we would have lost the lead" he said, "we lost the gap in that first lap [after Ricciardo pitted]. So we were planning to pit and then Daniel put out a stunner. The gap shrank and was gone, so we needed to just make it to the end." A mere two corners before the pit entry Nico was told to stay out, so to stick it out on very second hand rubber. Merc's hand was forced, but the play won Nico the race. "We peed our pants at the end, it was so close" added Wolff. "I must take my hat off to Red Bull, they pulled off a great strategy." Crucially though Ricciardo lost a bit of time in traffic which meant the next time around he only pegged the gap. Nico too seemed to have a bit of additional engine and brake edge in hand, which he used. He dangled the rope out as much as he dared, and come the end was still ahead, by a scant 0.488 seconds. "The guys back in the UK were telling us you're going to be around him with a couple of laps to go" said Horner, "but it looked like they [Mercedes] just kept enough in hand for those last couple of laps." Ricciardo expanded on the matter too. "It was close" he said, "as soon as we did the pit stop we thought Nico was going to come in, so we pushed fairly hard on those tyres. In the end they were a little bit dead, but at least we got close. "It was good to put a bit of pressure on them, I think we did all we could." 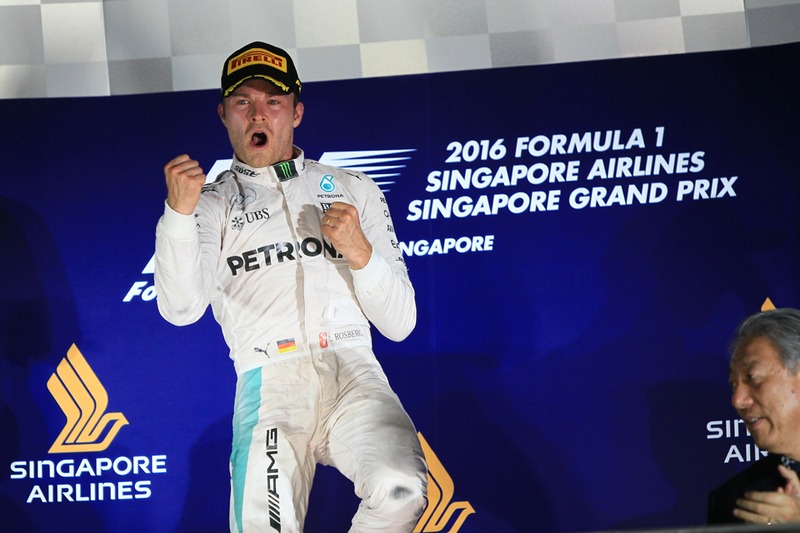 Rosberg, like his boss, also paid tribute to the Bulls' approach, describing it as "awesome". "It was not the easiest of situations" he added. But of course he was delighted with the result, and with his pretty much flawless weekend. "Winning the Singapore Grand Prix today is awesome" he said. "I'm really, really happy about that. The whole weekend went perfectly." The rest of us were left to wonder 'what if', with one more lap for Ricciardo? But the point is moot. For Nico the 25 points, his third helping from the last three, remain the same and astonishingly he now leads the drivers' championship by eight. This, even more than the thrilling final laps, should be our major take-out from this one. It was only seven weeks ago that we headed into the summer break assuming Nico was a beaten man. We assumed roughly the same thing just three weeks ago too when Lewis somehow salvaged third place after the break, in Spa, after a myriad of engine penalties. Both may as well be from another age. Just as after qualifying this weekend feels rather like a watershed for Nico, that we all had to sit up and take notice that he does after all deserve to be here. And in the race he dashed a few more common barbs against him - he can't do it when it matters? He can't do it under pressure? Not on this evidence. At the toughest race of the year bar none and with a highly aggressive foe hunting him down like a Jurassic Park dinosaur in the rear view, Nico was as solid as a rock. In truth though there were plenty of outstanding drives today, providing our latest demonstration of another truism - that the more you challenge F1 drivers the better they respond. 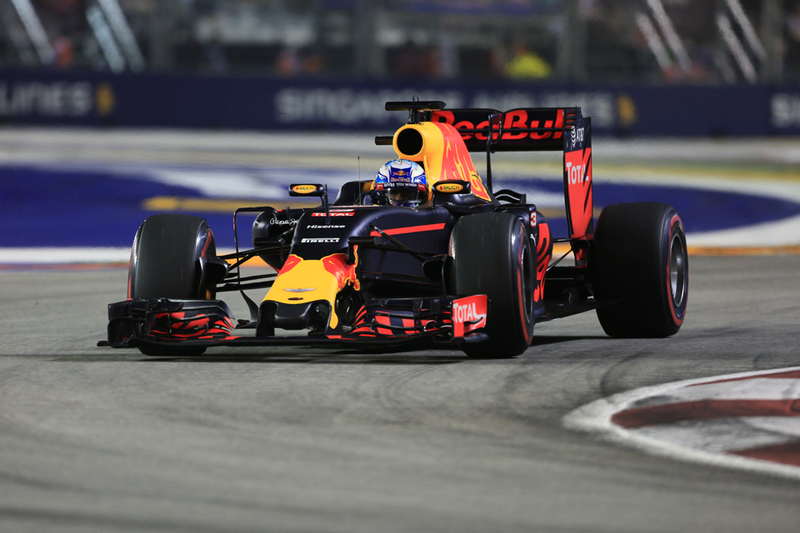 Ricciardo's drive was everything we've grown to expect from him - aggressive, flawless and above all very fast. The local specialist Sebastian Vettel stunned also, coming through from starting dead last to finish fifth, and perhaps the most remarkable part was that he was only 27 seconds shy of the winner at the end. And no, the safety car does not go much way to explaining that, as that was only out for the first couple of laps. "I think we slowly got into the groove and especially in the last two stints the car really came alive and we made good progress" said Seb. "It was good fun, I enjoyed it a lot. "I was hoping maybe we could get close to the battle for third with Kimi and Lewis but in the end the gap was a bit too big, I think we lost too much in the opening stages which also was expected. 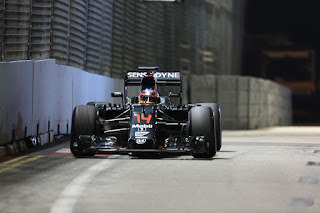 I think we were hoping for a safety car that didn't come, but nevertheless I think it was an optimum result." In yet another 'what if', we can only speculate where he would have been without his qualifying problems. 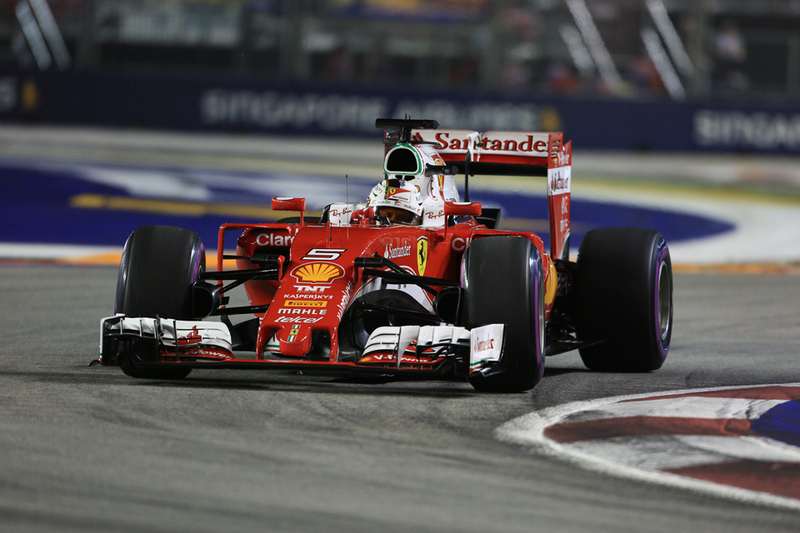 Fernando Alonso also excelled, to be the first home after the 'big six' of the Mercedes, Red Bulls and Ferraris. From starting ninth he appeared to benefit a lot from an accident at the run to turn one, Carlos Sainz pitching Nico Hulkenberg into the boonies, and he ran fifth early. But Alonso's picked up places so often in such circumstances it's hard to maintain that it's all mere luck, and from then on it was a typical-for-him consistent and clean conversion of a race strategy. Remember too that the evidence in advance, particularly on race pace, was that he had no right to be beating Toro Rossos, Force Indias, Williams and the like this time. One way or another he left them all far behind. His words afterwards reflected all of this. "Seventh was the maximum we could achieve today," he said, "the best of the rest after the two Mercedes, the two Red Bulls and the two Ferraris. "We weren't perhaps quite the fourth-fastest team here this weekend, so it’s thanks to good strategy and a good start that we were able to bring home this result." Kevin Magnussen too, almost unnoticed, bagged the final point for Renault without anyone being entirely sure how. He was another to benefit from the prang off the line, but from that point on too always looked quick and like Alonso his two-stop conversion was imperturbable. In F1 as in most activities we love to discuss what would have happened in a counterfactual reality - this article's had two of them already. And this of course applies to Massa's tale in 2008 which ended with him just missing out on the title - just what if Flavio Briatore, Nelsinho Piquet et al hadn't cooked up their scheme, and the Brazilian presumably had cruised to the Singapore win just as Nico did today? Well this time, in our equivalent, it seems we'll get to find out. Nico himself, as after his Monza win, insisted though he's not thinking about the title, that in the stock footballer response he is taking every game as it comes. Upon being told that seven times in the previous eight seasons the driver leading the table leaving Singapore has gone on to win the honours, Nico stated that "a statistic like that, it's not something that I focus on, at all. It doesn't have any importance to me. Today I'm just happy to win the race because that is what I came here to do." But if he is really thinking that way he must be almost alone. Lewis meanwhile was looking on the bright side, stating that "I don't know why [I'm confident]...but I've definitely been in a lot worse [positions]." Make sure you're strapped in for this one.